My first attempt took all morning. The edge turned out about 6mm wide and a less than ideal shape. I must have got something wrong with the heat treatment too, because it refused to take a decent edge. 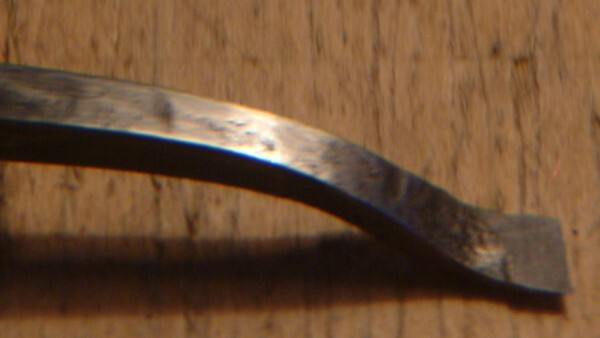 After pondering the problem over lunch, I decided to cut off the tip and re-forge it as narrow as I could. About an hour and a half later I had produced a new tip that was about 4mm wide and a better shape. I think I solved the heat treatment problem too. Still not as narrow as hoped, but it is a useful width, so I decided to make a handle for it as it was rather than cutting the tip off again and trying to make it even narrower. The handle is made from a piece of spalted sycamore that was originally destined to be firewood. The shank is a bit longer than I intended but actually I've found that if you hold the cranked part with your fingers pressed firmly against the work so it can pivot from the crank, the long lever allows you to guide the blade very precisely. It would be easy to be disappointed that I didn't manage to make exactly what I set out to make, but I had fun and learned a few things, and I ended up with a useful tool at the end of it. Not a bad way to spend a day off really! I also have a plan B regarding the extremely narrow chisel that I'm going to need for the inlay work, involving re-grinding a disposable scalpel blade. Quenching in oil rather than water may have been the problem, or I might have over-tempered it (or both). I usually significantly under-estimate how much a piece of metal is going to lengthen by when I draw it out, which I had to do when I re-forged the tip because the shank of the tool has to be narrower than the (fishtail shaped) tip. 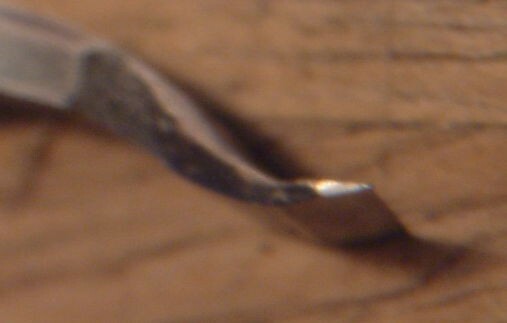 I took these blurry pictures of the chisel tip while wibble_puppy held a large magnifying glass between the lens and the chisel. It helped slightly. I looked into getting a proper macro lens but they were all way over my budget. I'm wondering if it might be worth getting an extension tube set or something instead. I have a rather flaky ten year old Fuji FinePix S2 Pro SLR with a Nikon AF mount. It has recently stopped letting me focus manually, which really doesn't help because it often tries to focus on the wrong thing. Not sure if the problem is in the lens or the body (I only have one basic kit zoom lens).